If you are looking for an online casino to play the games and enjoy the excitement from your own home, few can match Vegas Hero online casino. Vegas Hero has exciting bonuses, a wide range of great games, and computer apps that let you play right from your smartphone or other mobile device. When you make your first deposit with Vegas Hero, not only will you get a matching bonus up to $/€100, but you will have access to hundreds of video slot games, table games, and live casino games including ones accessible from your smartphone. This is a state of the art online casino operation with a high level of security, fast processing so the games are always exciting and not annoying. And, Vegas Hero’s promotions never seem to end. Vegas Hero offers a wide range of attractive bonuses for new and established players. Make your first deposit with Vegas Hero (as little as $/€10) and get a matching bonus as well as fifty free spins. The first deposit is matched 100% up to a maximum $/€200 bonus and all of your free spins come with the first deposit. There is a 50% match on the second deposit up to a bonus of $/€200, a 25% match on the third deposit up to a bonus of $/€300, and a 25% match on the third deposit up to a bonus of $/€300. The minimum deposit is $/€10 to receive a bonus on any of the first four deposits. You will need to bet on the first four Welcome bonuses forty times in order to withdraw a Bonus or any associated winnings. And, deposits with Skrill and Neteller will not have this bonus. Besides having a nice welcome bonus, Vegas Hero also has an additional Live Casino welcome bonus of a 100% match of your deposit up to a $/€100 bonus. Players must wager at least forty times before being eligible to withdraw the bonus or winnings from the bonus. Note: Deposits made with Skrill and Neteller do not qualify for this bonus. Make your deposit on a Tuesday and be sure to choose Tuesday Bonus from the dropdown list. You will receive a 25% match on your deposit up to a $/€100 bonus. Note: Vegas Hero only allows one active bonus at a time. So, be sure to use up your welcome bonus or live casino welcome bonus before trying to get the Tuesday bonus. Players who have made a deposit in the previous seven days are eligible for this bonus. From Thursday to Saturday you will receive an email notifying you of a special bonus. Vegas Hero emails its players with lots of information. Make sure to whitelist Vegas Hero emails so that you don’t miss out on anything. For specific instructions about how to do this, go to Vegas Hero promotion details and follow the instructions. 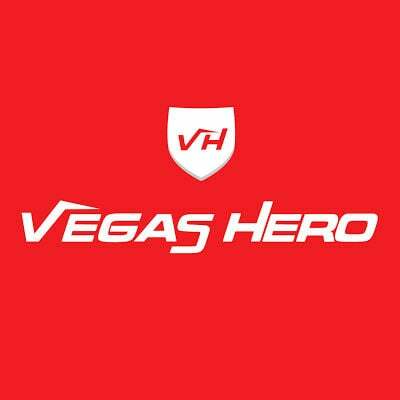 With the Vegas Hero VIP program, you have your own manager dedicated to your own account. And, you will receive bonuses that are exclusive to VIP clients! There are many events that are limited to Vegas Hero VIPs and even a monthly VIP-only price draw. When your birthday comes around Vegas Hero remembers with personalized birthday gifts. Withdrawals are easy with the VIP personalized withdrawal service. 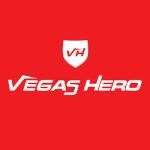 If you are interested in holiday packages or even flights to Las Vegas, be sure to check out the Vegas Hero VIP program. With the welcome bonuses, players must wager each bonus 40 times before they can withdraw the remaining bonus or any winnings from playing the bonus. The welcome spins require that a player has a turnover of at least $/€ on the new player welcome bonus before any spins can be played. With the live casino bonus also requires playing 40 times before withdrawing bonus money or winnings from playing the bonus. In regard to the Weekend Smash bonus, the player must have a turnover of at least $/€ on their deposit before any spins can be played. With all bonuses, a player can only have one active bonus at a time. Funds can be deposited with Vegas Hero by way of MasterCard, VISA, VISA Electron, paysafe, Skrill, NETELLER, ecoPayz, Maestro, and entropay. When you make a deposit by any of these means the money is credited to your account immediately and there is no charge associated with the receipt of the money. The minimum deposit is $/€10 and the maximum is $/€5,000 except for ecoPayz ($/€1,000) and paysafe ($/€300). Payments are made with the same transfer processes used for your deposits. As with your deposit, there is a $/€10 minimum and a $/€5,000 maximum for payments. And, ecoPayz ($/€1,000) and paysafe ($/€300) have different maximums. Vegas Hero has a secure and streamlined payment process. This starts with Vegas Hero following the gaming commission’s “Know Your Customer” rule. The first time you request payment, Vegas Hero will confirm your identity before reviewing your account and initiating your withdrawal. Once Vega Hero has your information in hand it will verify your account after which it will require 48 hours for withdrawal review. Here are the documents that you will need to upload to make your subsequent payments processes fast and efficient. For this you will need copies of a personal identification document. You can provide a clear and complete photo or scan of your credit card, E-wallet, or bank statement as proof of payment. For Sofort, Euteller, or Pugglepay you can provide screenshots or photos proving your casino transactions. Vegas Hero asks for a screenshot of your account for a prepaid card such as Paysafecard. This needs to show the casino transaction, PIN number, deposit date and amount. For this you can provide a letter from your bank or bank statement, a utility or other bill (mobile phone, cable TV, water, gas bill, electricity, or even magazine subscription). A payslip or a tax bill such as a vehicle tax is also OK. If you rent from an official organization, rental contracts are acceptable. Also, insurance payments or any formal letter from an official organization will do. In any of these instances, provide a PDF version of a clear scan or photo of the physical document. And, any document you choose must be no more than three months old. Vegas Hero will accept them if they are complete, clear, and clearly official. Luckily, this only needs to happen one time. Once Vegas Hero has confirmed your identity, subsequent payments will prompt and painless! Now we get to the real reason you are reading this review of Vegas Hero, the games! Vegas Hero offers several hundred exciting video and online slot games with impressive jackpots. More than half of these games can be played on a smartphone or other handheld device for fun on the go. If you like blackjack, Texas Hold’em, or almost any variety of poker, you will find a table game to your liking at Vegas Hero. Likewise, Vegas Hero offers many variations of Roulette and Baccarat. Do you want a game with a live dealer? Vegas Hero has many of these as well. As a player at Vegas Hero, you will have the opportunity to play in live games from casinos across the world. With Vegas Hero, you can use mobile apps fit for Android, Apple, and Microsoft mobile devices. Table games, live games, and slots are all included. 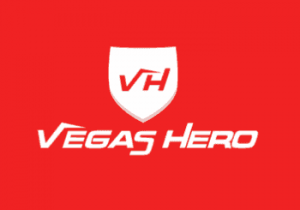 Security is top of the line at Vegas Hero, a global casino destination for online clients. Vegas Hero commits to providing a responsible, safe, and secure environment for online gaming. Genesis Global Limited is the operator of Vegas Hero. They are located at Level 6A, Tagliaferro Business Centre, Gaiety Lane (Triq Il-Kbira) c/w High Street, Sliema, SLM 1549, Malta and are a Malta corporation, registration number C65325. They are licensed (MGA/B2C/314/2015) by the Malta Gaming Authority and also are regulated in the UK by the UK Gaming Commission (000-045235-R-324169-007). If you have a question at Vegas Hero just click the “?” icon in the upper right corner of every screen. There are nice sections for FAQ, rules, payments, and forgotten passwords. You can chat with customer support and call them directly at 0800170016. There does not, however, seem to be an email address for contacting them for help. Vegas Hero has lots of great slots, table games, and live casino games. Their apps make it possible to play from your smartphone or other mobile device. They have a generous welcome bonus. However, please be aware that the entire $/€1,000 welcome bonus you will need to make four separate deposits. And because the matching falls from 100% to 50% to 25%, you will need to deposit $/€200, $/€400, $/€1,200, and $/€1,200 to receive the entire $/€1,000. The lack of an email address for questions is a little irritating but they provide a phone number and online chat. Vegas Pro gets a “thumbs up” as an exciting online casino with good bonuses and VIP perks. Being able to play their games using a mobile device will be an added benefit for a lot of players.